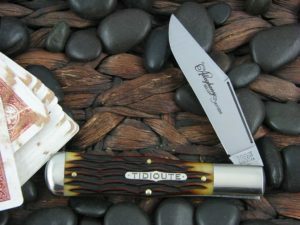 This is the Great Eastern Cutlery Tidioute American Jack, has Smooth White Bone handles and Brass liners. 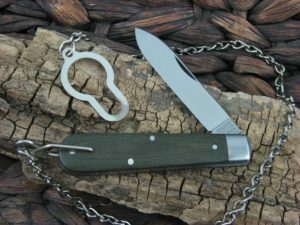 The blade steel is 1095 and finish is Satin. *Our opinion: The pull is a 6. The GEC effort on this run as compared to their entire catalog is 9. Knife is solid. The quality control on this is pretty good. 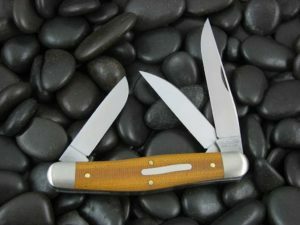 I have case knives and have had to hand pick them due to their bad QC. This knife is solid, feels really tough. I believe it can do the job of those roided out folders they keep producing these days. Stash this in your watch pocket, beat it up, pass it down to your grand kids. If this comes back in stock, buy it. I ain’t selling you mine! 5 out of 5	Tough Build! It’s a tough build for sure! I grabbed one, but should have bought two. Tough enough for almost any task. 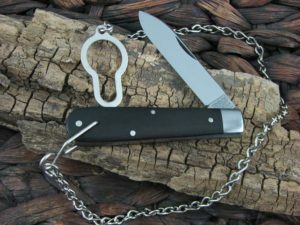 Not to big not to small, just the right size to put in a small buffalo skin sheath and drop in your pocket. The customer service at Collectors Knives is top notch! Mike is a great guy and I love the new online store. It shipped right away and I received it real fast. I will continue to buy knives from Collectors Knives for sure!! This single blade 78 is exactly what I look for. Well crafted. Slim,comfortable fit for the pocket. Big enough to use. Small enough to be carried.